I've been a fan of Brian Tyler's music (The Expendables; Into the Storm; Iron Man 3; Now You See Me 2; Saban's Power Rangers; Transformers Prime; Truth) for quite some time. 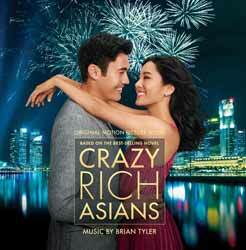 However, his work on Crazy Rich Asians has to be one his most impressive and diverse so far. The album contains 24 tracks (1 hr, 03 min, 39 sec) and, with Tyler showcasing his talents as a composer of Jazz, Big Band numbers, and romantic, beautiful orchestral themes. If you've seen the movie you'll already know how important a part the music plays in the whole experience, and listened to on its own merits the music works perfectly as a standalone album. Tracks like 'Cousin Eddie and Cousin Alistair' show a side of Tyler that we rarely get to see. This is a light-hearted, fun track. However, the majority of the score is packed with slow, romantic melancholic themes, which work incredible well. Personal highlights include 'Love Theme from Crazy Rich Asians'; 'Approaching The Palace'; 'Solitude'; 'Arrival in Singapore'; 'Rachel's Story'; 'Choices'; 'Astrid and Rachel'; 'Running Away'; and 'Because of Me'. Tyler has pulled out all the stops on this one, delivering a rich, beautiful album.